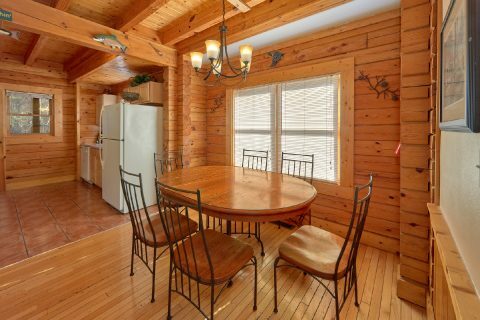 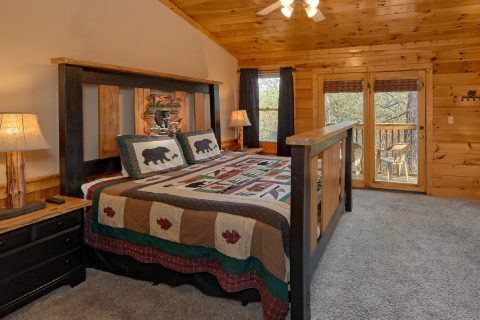 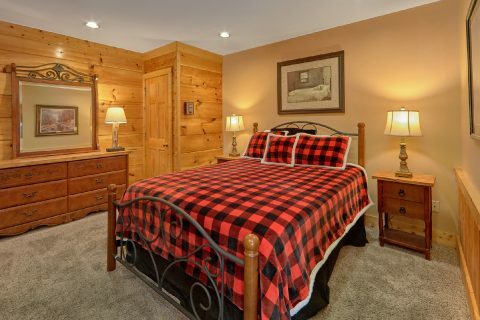 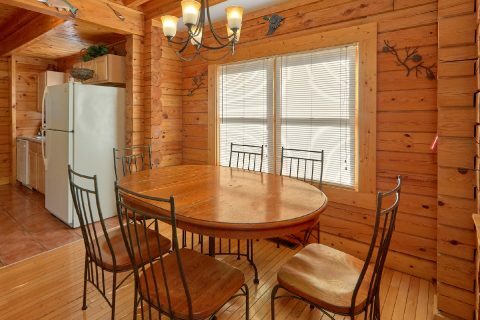 "Growly Bear" is a lovely cabin duplex located in the Big Bear Resort area of Pigeon Forge, a conveniently located cabin community that's only minutes away from the biggest attractions in the Smokies! 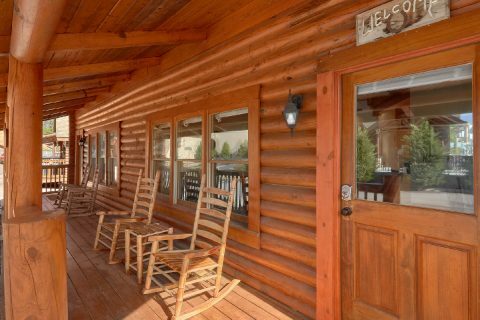 Since this cabin rests only a mile from the heart of Pigeon Forge, guests of this cabin rental can easily reach big attractions like The Island, Dollywood, and the Titanic Museum. 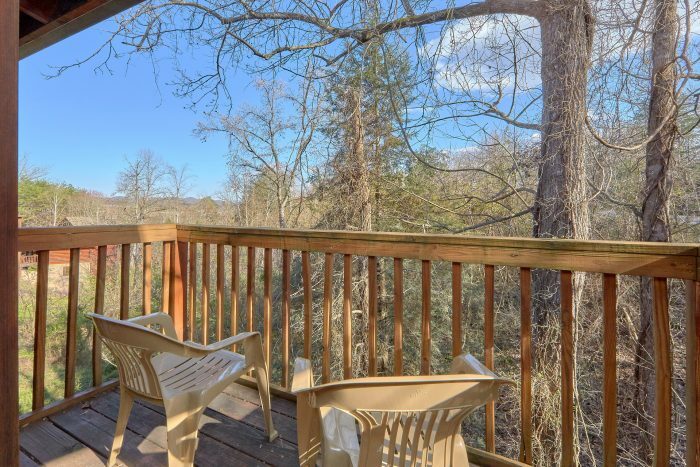 Better yet, other top destinations like Gatlinburg and the Great Smoky Mountains National Park are only a short drive away from this cabin that's only minutes from all the action. 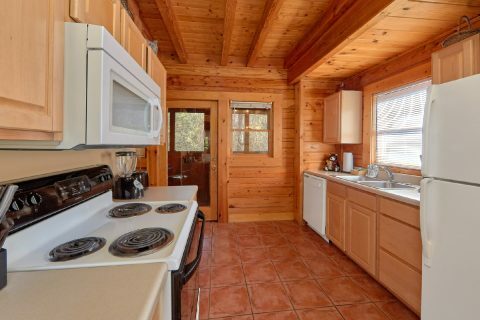 When you aren't out enjoying the best that the Smokies have to offer, you'll love resting and relaxing in this comfortable cabin duplex in the Big Bear Resort area. 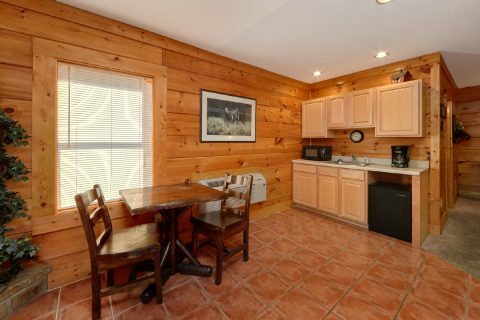 As a result, you'll enjoy additional resort amenities like a resort game room, exercise room, an indoor pool, and an outdoor pool! 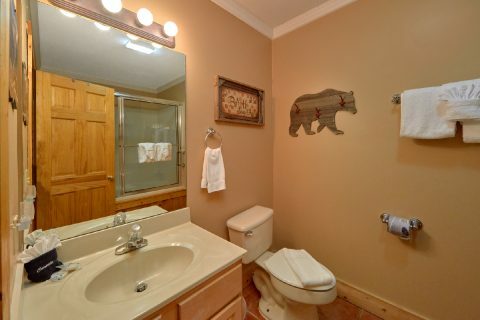 Better yet, this rental is conveniently located across the street from the outdoor pool! 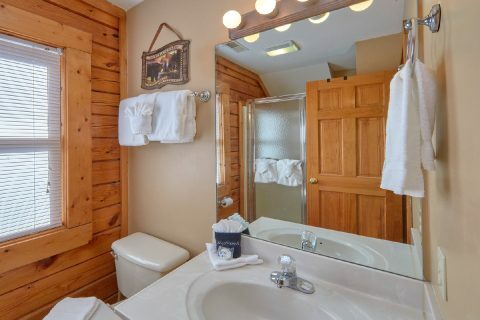 As soon as you enter the main level of this rental, you'll be glad you booked a quality cabin for your stay. 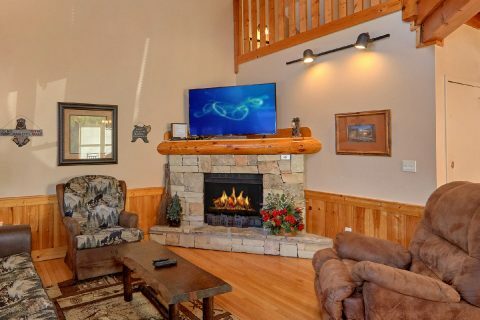 The welcoming living room area provides high ceilings, a gas fireplace, a television, and comfortable furnishings. 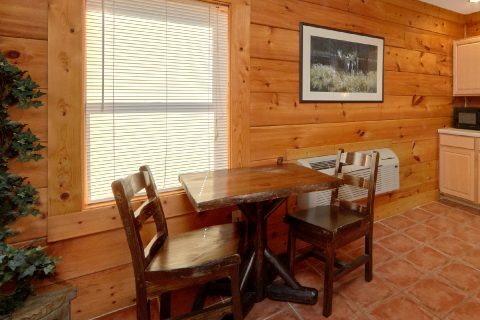 Nearby, you'll find a full kitchen and a dining area for enjoying delicious meals in the comfort of your rental. 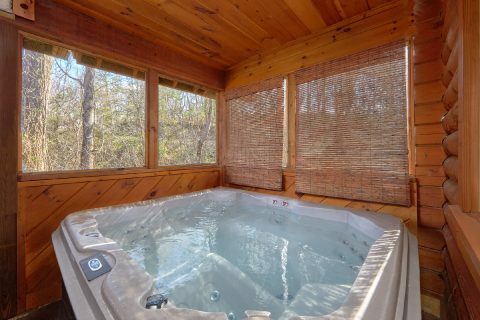 On your cabin's enclosed back deck, you can always take a dip in the warm waters of your cabin's hot tub. 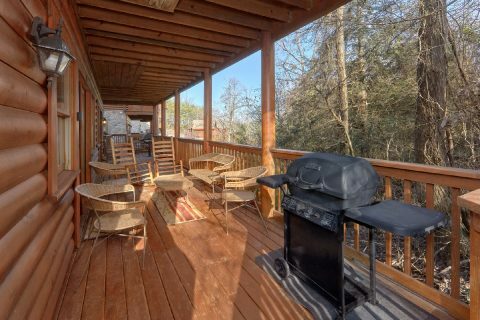 Additionally, your cabin's front porch and back deck both complete with rocking chairs to enjoy the fresh mountain air. 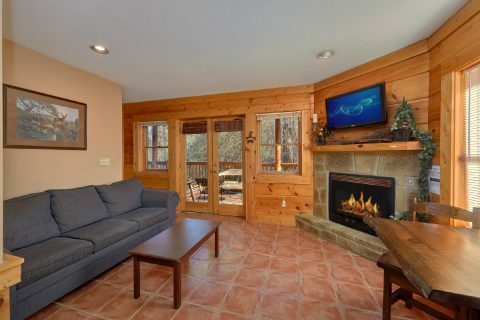 Downstairs, you'll find even more comfortable living space in the 2nd living room area with a fireplace and a wet bar. 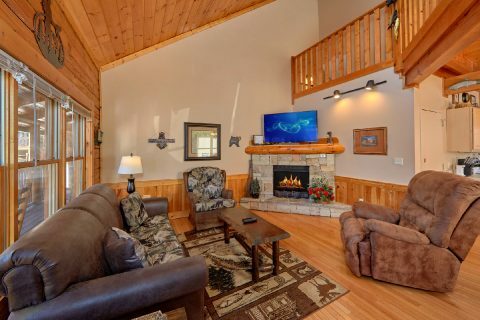 With 2 bedrooms and room for up to 9 guests, this affordable cabin duplex is just the right size for a family vacation or a fun getaway with friends. 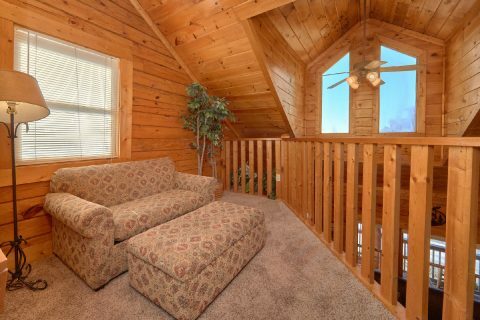 Upstairs, you'll find a premium king bedroom complete with a private bath and an upper-level balcony. 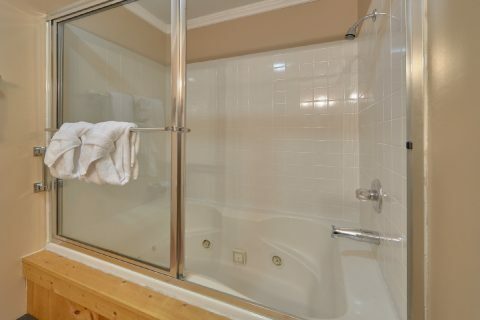 Downstairs, there's a queen bedroom with a bath that features a jacuzzi tub. 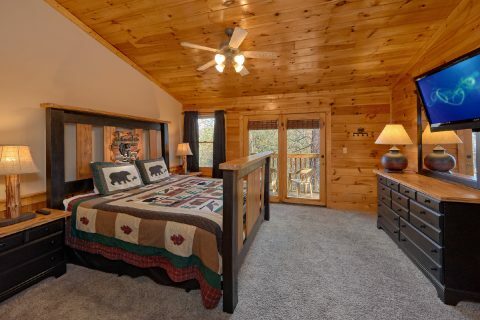 Lastly, for extra guests, there's a twin bed in the upstairs loft, a queen-size sleeper sofa in the main level living area, and another queen-size sleeper sofa in the lower level living room. 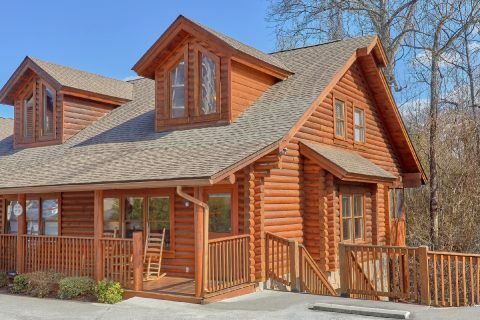 Last, but not least, this cabin near Downtown Pigeon Forge provides practical amenities like WiFi Internet, a gas grill, and a washer and dryer for you to use during your stay. Book this cabin with a great location and everything you need for a great stay in the Smokies today to save 15% with our special cabin discount! 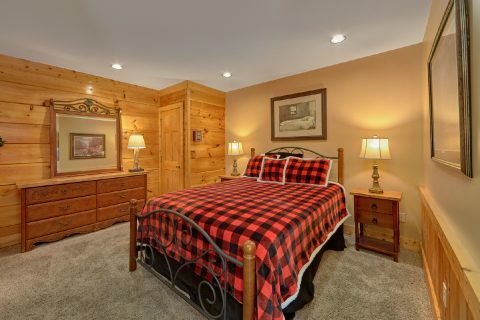 Simply check this cabin's availability to see how much you can save when you book with Cabins USA Gatlinburg!